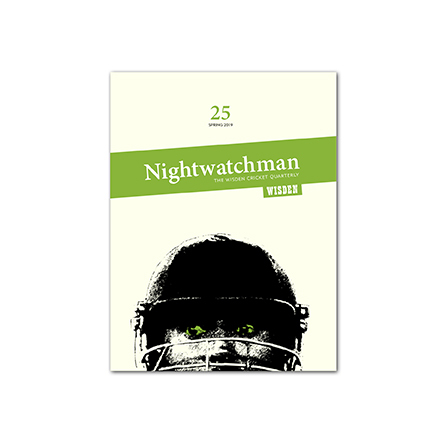 Issue 13 of The Nightwatchman is dedicated to county cricket. The Championship, entering its 126th year, is often derided and forever under threat. Yet it remains the background music to the summer for thousands of cricket fans up and down the country, eliciting strong emotions from members whose allegiance is county, not country. County cricket is too regularly taken for granted, but most genuine lovers of the game in the UK have “their” team, and most first learnt to love the game accompanied by a scattering of like-minded souls watching local heroes battle it out on windswept or sun-dappled county grounds. Most will have their favourite county players, often picked for purposely perverse reasons – an autograph smilingly signed, a comedy nickname, a resemblance to a family member – and most still keyboard-click straight to their side’s scores, monitoring the progress of the young bucks, willing the old guard towards some milestone or other. For this collection, we asked a range of writers to write about a county – no real brief, no restrictions – to see what transpired. What comes across most is the heartfelt warmth – love even – with which the county game, past and present, is viewed. What is also evident is the belief that county cricket is clinging on, in its death throes, and needs all the attention it can get to survive. Whether it’s Phil Walker on Essex, Emma John on Lancashire, Matthew Engel on Northamptonshire, Michael Simkins on Sussex or Ian McMillan on Yorkshire, here are folk whose -shires and -sexes have been their lives and their loves, who are remembering the good times while desperately hoping that county cricket will not be allowed to die of old age. Each county is covered (alphabetically to avoid any personal bias) but there are also contributions from Benj Moorehead as he follows BBC radio county commentaries from abroad; from Middlesex captain Izzy Westbury, who asks whether women’s county cricket helps or hinders; and from Paul Edwards, with a love letter to outground cricket.